(Nanowerk News) Motion and precision positioning systems expert PI (Physik Instrumente) released a new catalog on capabilities regarding engineered motion and automation solutions for high-tech industries such as photonics, precision optics, semiconductor and medical engineering. What sets PI’s engineered motion systems division apart is their in-house access to the broadest and deepest portfolio of precision motion technologies. Creative-thinking engineers with vast experience selecting the right technology for each individual application are the cornerstone of PI’s successful approach. Customers have saved considerable time and resources by requesting free advice from PI’s engineering teams around the world, who draw upon 1,000s of standard products ranging from electromagnetic to piezoceramic motors, digital and analog controllers, serial and parallel kinematic motion systems, capacitive, inductive and optical nano-precision sensors and guiding systems that span from flexures to magnetic levitation and air bearings. Custom engineered motion systems can be leveraged for industry and research. 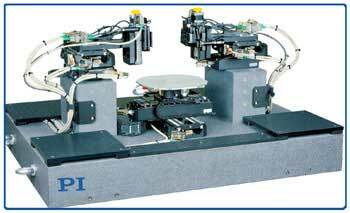 s PI is a leading manufacturer of air bearing stages, piezoelectric solutions, precision motion control equipment, and hexapod parallel-kinematics for semiconductor applications, photonics, bio-nano-technology, and medical engineering. PI has been developing and manufacturing standard & custom precision products with piezoceramic and electromagnetic drives for 4 decades. The company has been ISO 9001 certified since 1994 and provides innovative, high-quality solutions for OEM and research. The PI group employs more than 1,000 people worldwide in 15 subsidiaries and R&D / engineering centers on 3 continents.